Clock (2016) was commissioned as a piece of social furniture for the International Center of Photography Museum at 250 Bowery in New York City. 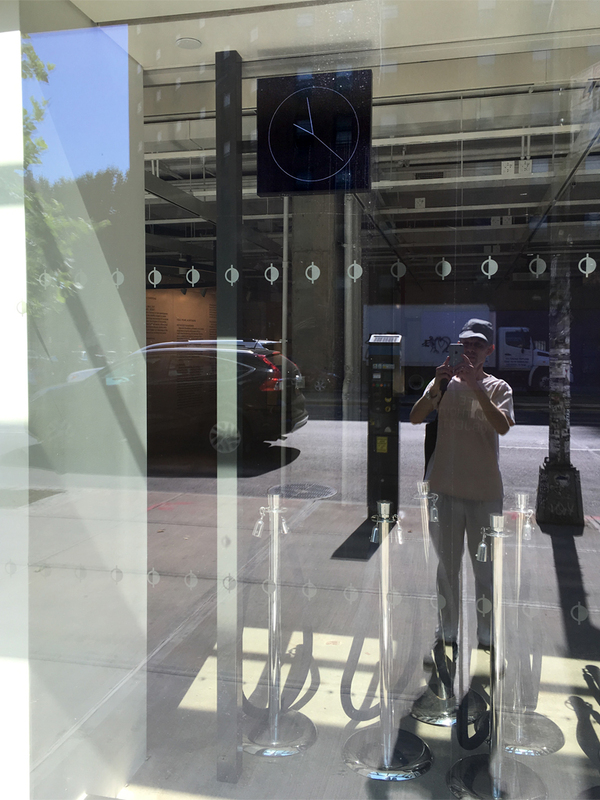 It consists of two parts: a digital-analog clock face at the front of the space facing the street and a pair of projections in the rear. The abstract screens are accompanied by a concrete clock face, as a flag-mounted digital monitor on a pole directly at the street. Here, custom software creates a digital rendering of an analog clock face as a marker of the consistent back and forth play between continuous and discrete, between analog and digital, that describes many of the images we live with now. Meanwhile, a bot runs online, collecting and distributing the shuffled images. Commissioned by Charlotte Cotton for “Public, Private, Secret”, developed with Lily Healey, and installed in collaboration with Common Room.